Revolutionize your ride with power-based training! We offer the highest quality indoor Spin bike on the market today. The Spinner® Blade ION strain gauge and ANT+ power meter provides riders with real-time measurements of individual effort for greater training efficiency and performance results. The Spinner Blade ION power meter technology is coupled with an exclusive power-based training program. The SPINPower technology is unique because it tells riders how hard they are working, allows them to measure progress, and tells them what fitness variables they need to change. WHAT MAKES The SPINPower technology unique? SPINPower technology allows riders to see how hard they are working, allows them to measure progress, and tells them what fitness variables they need to change. The goal is to improve wellness, fitness and performance of all populations, in a Spinpower™ class. To ensure accuracy outside of the lab environment, a simple, yet repeatable ramp protocol is necessary. The Personal Spinning Threshold Test (PST Test), achieves all goals. PST represents the personal exercise baseline intensity appropriate to the individual, not that of anyone else. The highest sustainable work rate is achieved at a sub-max effort. Therefore, nearly all populations, regardless of their goals, can and should perform the test. The result is the maximal efficient effort, or the PST baseline fitness marker. Once determined, Spinpower™ Zone are established. Training below PST reflects aerobic conditioning. Training above PST represents anaerobic training. Training around PST gives threshold-boosting benefits. Riders experience a challenging, exhilarating and fun workout. 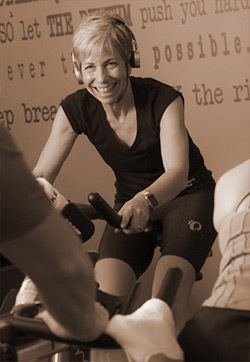 Knowledgeable and inspiring Certified Spinning Instructors — the core of Spinning — ensure riders enjoy the journey.